As the weather starts warming up, it’s time to think about spring cleaning and getting our home ready for summer. At AC-World, we see most of our business in the summer months, as customers rush to replace their damaged air conditioning systems. This is why we recommend that those of you with a traditional central air conditioner do the following checks well before your need your unit to work. The starting capacitor is one of the parts of a central air conditioning system that’s most likely to fail. It’s doesn’t cost a lot to replace it, but if it’s not working it will prevent the entire system from using. You’ll need to work with an HVAC professional to have this checked. While they’re there, they can check other commonly damaged parts. There are a few maintenance steps that can be taken to ensure a unit is operating as efficiently as possible. First, take a hose and rinse of the coils of your air conditioning unit. Be sure to get rid of any debris that’s accumulated during winter. Then ask an HVAC technician to take off the panels of your AC and clean the coils even deeper. The cleaner you get your coils, the better the air flow will be – and the more efficient the entire system is. Most people know they need to replace their air conditioning filters but too often they simply forget or don’t make it a priority. These filters are relatively affordable but can make a big difference in how well a unit works. If you invest a few dollars into new filters when you need them, you can save significantly on your overall heating and cooling bills. Of course, at AC-World we know there’s a better option than performing maintenance and repairs on central heating and cooling year after year: Multi-zone ductless air conditioners . These units allow you to control the temperature in various rooms instead of having a single temperature set for the entire home. If you’re curious about how these units work, or you need help deciding if one is the right choice for you, feel free to reach out to us. We’re here to help every step of the way – including answering your installation questions. Test Yourself: Do You Know the Advantages of a Ductless Air Conditioning Unit? Could Your Allergies Be Making You Less Safe on the Roads? What Does It Mean to Zone My HVAC System? 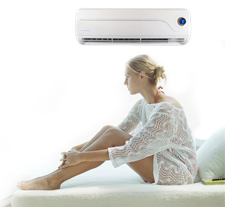 » Test Yourself: Do You Know the Advantages of a Ductless Air Conditioning Unit?